Boyle Arts Festival 2017 was a resounding success and the BAF Committee would like to extend heartfelt thanks to all who helped make it possible. To begin with, we would like to pay tribute to those who continue to support us year after year and without whom; we would undoubtedly have no Boyle Arts Festival. Once again, we received tremendous support from the people of Boyle – in terms of sponsorship, attendance of events, provision of venues, premises and of course that wonderful hospitality that welcomed the considerable numbers of visitors to the town. The Arts Festival is a serious undertaking for a voluntary committee of ten – this year’s Festival featured seven separate art exhibitions, six workshops and 53 performance events, many sold-out in advance – spread over eleven days! 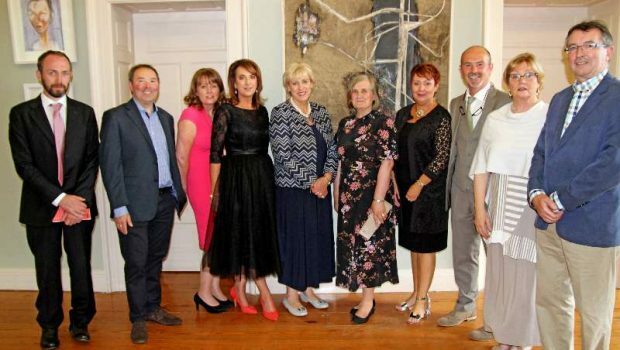 In addition to our local sponsors, who we encourage everybody to support, we must also acknowledge the support of the The Arts Council, Fáilte Ireland and Roscommon County Council. Publicity is an integral part of any Festival and we would like to thank all the local, regional and national newspapers, including the Roscommon Herald, Roscommon People, Leitrim Observer and Sligo Champion. Also, many thanks to all at Shannonside Radio, iRadio, Ocean FM, RTÉ Lyric and RTÉ Radio 1 for all their help over the last few months. Very special thanks to our two local websites www.boyletoday.com and www.realboyle.com for all the publicity afforded to us, both before and during the Festival. We are deeply indebted to all of our local volunteers, who gave so freely of their time by helping at the ‘door’ during events, collecting and hanging artwork, assisting in the ticket office, distributing posters and programmes, assisting at the exhibitions and events, directing parking, providing security and indeed helping out in any way. To all those who brightened up the town by allowing us to hang our bunting and to all who made vacant premises available to us, a very special word of thanks. A special thank you also to those in King House, the Church of Ireland, St. Joseph’s Hall, St. Joseph’s Church, Abbey Community College, Boyle Parochial School, Boyle Enterprise Centre, Boyle Resource Centre and The Spool Factory, for the use of their venues. We must also extend thanks to Perpetua McGee of ‘Marians’ for allowing us to use her premises as our Festival office and to Thomas Gallagher and Mick O’Dowd for providing storage facilities. Many thanks to Boyle Musical Society for providing their lighting and to Tom Cleary for operating it so spectacularly! We are extremely grateful to Benny Morgan, Mary Regan, Brian Nerney, Sean O’Dowd and Brian Farrell who took photographs during the Festival and allowed us to share them on our social media channels. We must extend sincere gratitude to all those who travelled from near and far, to attend all of the events, exhibitions and workshops at Boyle Arts Festival 2017. We have been overwhelmed at the support we received, especially from the people of Boyle who turned out in greater numbers than ever. Almost every event had capacity audiences and several were even sold out in advance! We are truly grateful to the local and wider community, for all their support. And finally, we would also like to thank all the visual artists, performers and contributors who took part in BAF 2017 and especially all the local artists, who once again made this year’s Festival so special. Without them, Boyle Arts Festival would be incomplete and it is heart-warming to think that there is so much great talent on our doorstep! Plans are already underway for next year’s Boyle Arts Festival, which will run from July 19th to 28th 2018 and we are hoping to deliver another fantastic experience – so why not put those dates in your diary now! For more information please go to www.boylearts.com or follow us of Facebook and Twitter. The Boyle Arts Festival Committee. Photo: BAF Committee with Minister Heather Humphreys and Main Exhibition Curator, Paul McKenna.